presented by avenue 50 studio “poesia para la gente” scheduled readings by poets iris de anda, abel salas and matt sedillo followed by an open mic on saturday may 25, 2013 at the home depot workers center in cypress park. 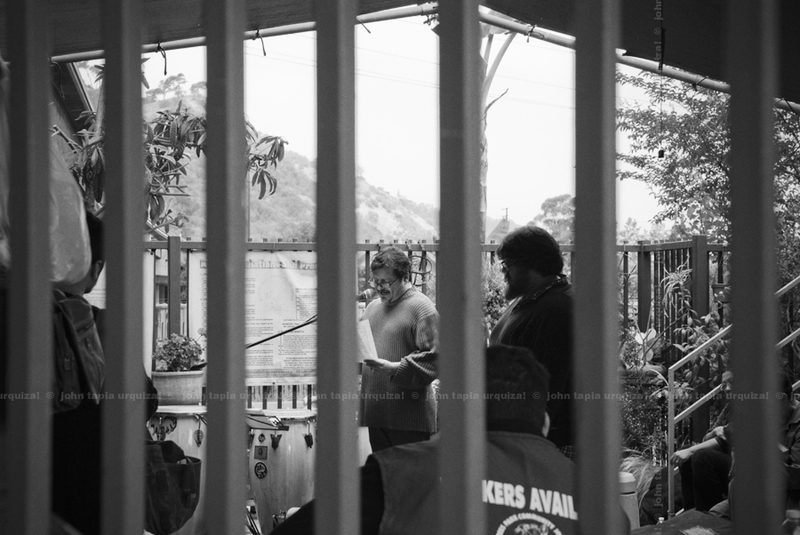 more than half dozen poets gathered in the morning along with the usual day labourers sanctioned by the center. 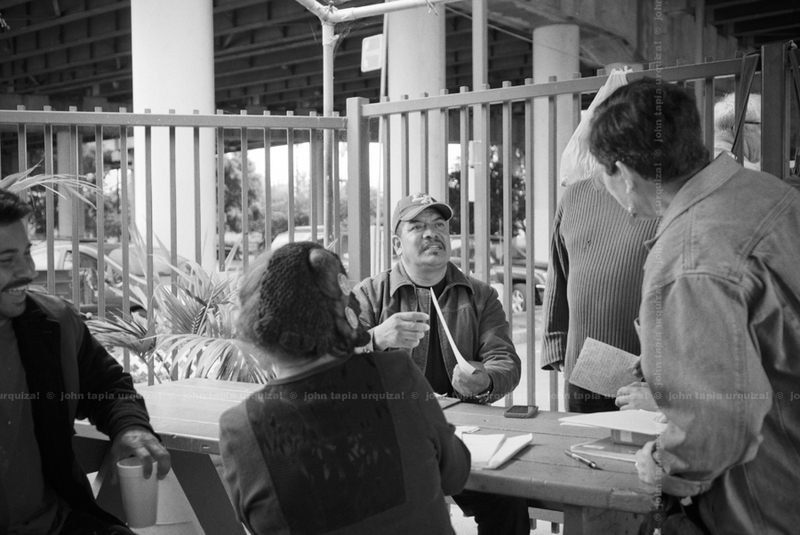 the worker’s center is operated by IDEPSCA, instituto de educacion popular del sur de california and is located at the south western corner of the parking lot, under the interstate 5 overpass. at first the rush of cars and semi trucks four or five storeys above is a bit overwhelming, but eventually the traffic becomes a white noise as you settle into the cool morning air with a white styrofoam cup of antigua coffee and a pan dulce from la morenita. if you have ever hired a day laourer at all, you know that they are different than us. they are in their work clothes, we are in our saturday casual clothes. we pay them cash at the end of the day, while we get a monthly check, sick days and even vacation days. we for the most part speak english, they for the most part speak spanish. they come to our home and work on any given specific task we ask for the day, we commute to a concrete cube and probably like myself push paper around a desk and stare at a computer screen. if we have never hired a day labourer that knowledge and experience gap between us is even greater than the border that separates them from their origins and even their family. we are different. we are separated by perceptions and fears, money and status. 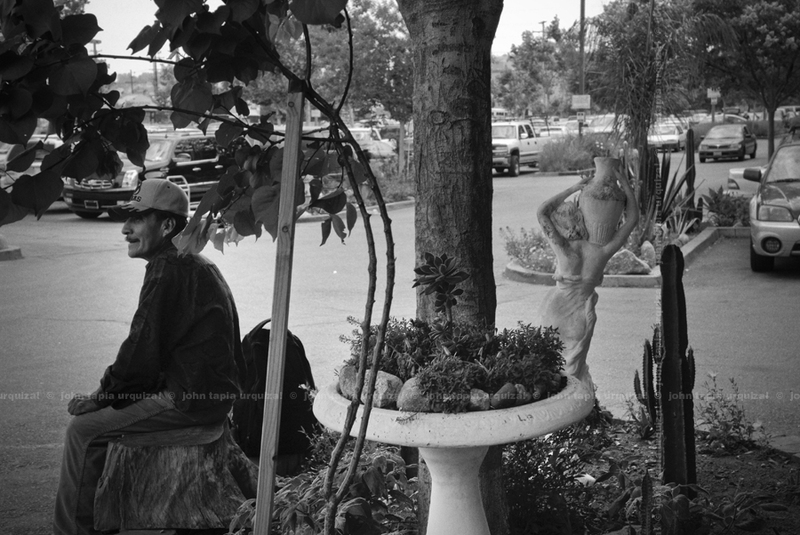 on the westside of the home depot parking lot are the workers with an identity card that qualifies them to be hired out through the center. on the opposite side of the lot with a few on the north are the day labourers with no documents or disposition for that kind of organisation. it is every man and his own skills for himself, while larbourers at the work center are selected by lottery as clients come seeking help. the work center labourer can negotiate their own rate depending on the tasks, as well as pass on a job for the next labourer in the lottery line. when your car pulls up to the east lot with the unregulated labourers it is the man and sometimes woman who can shout the loudest, jump the highest in the crowd and elbow their way into the passengers seat or the back of your pick up truck that will work on that day. the others will retreat to the shade of the curbside and wait for the next vehicle to pass. as a veteran of many readings dating back to the late 80s and the days of the onyx and e-bar in los feliz and pasadena respectively, i can say they have become quite predictable. 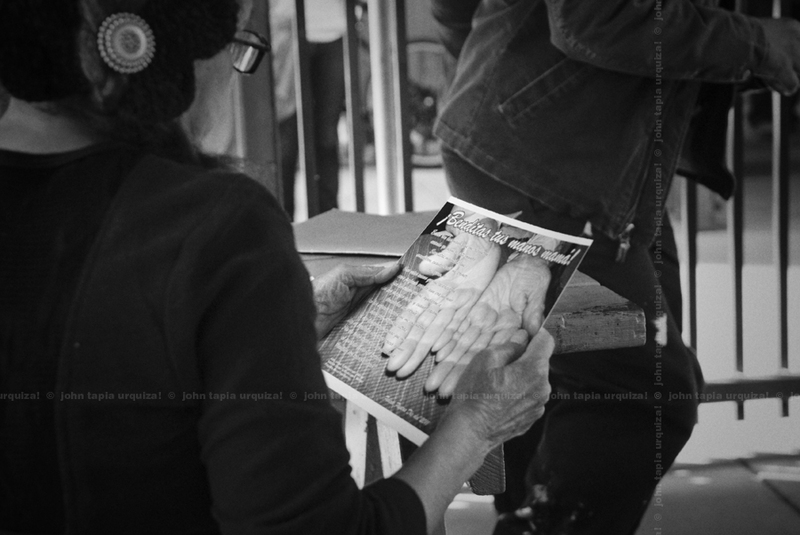 the breakout moment at “poesia para la gente” came when a day labourer closed the gap between us a little more. day labourer and poet leonso “el revolucionario” martinez read his works “stray dog” and “¡benditas tus manos mama!” in spanish. 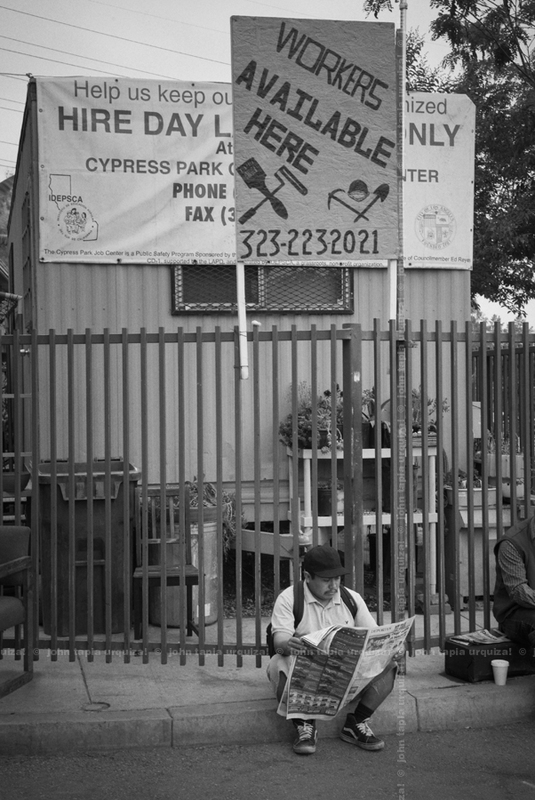 a labourer reads the morning newspaper before the poets started arriving at “poesia para la gente”, may 25, 2013, IDEPSCA work center at the home depot, cypress park. through the gates of the worker’s center abel salas of the community arts newspaper “brooklyn and boyle” reads the spanish translation of a poem with poet matt sedillo reading the english version at “poesia para la gente”, may 25, 2013, IDEPSCA work center at the home depot, cypress park. iris de anda reads from her folio while the day labourer and poet leonso “el revolucionario” martinez looks on and waits for his turn to read at “poesia para la gente”, may 25, 2013, IDEPSCA work center at the home depot, cypress park. 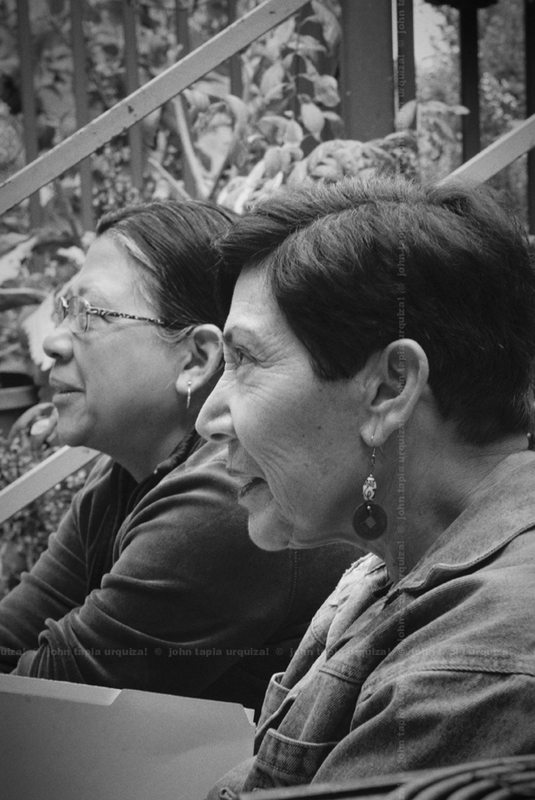 two audience member look on as abel salas reads at “poesia para la gente”, may 25, 2013, IDEPSCA work center at the home depot, cypress park. a day labourer and the the poet flor de te talking at “poesia para la gente”, may 25, 2013, IDEPSCA work center at the home depot, cypress park. 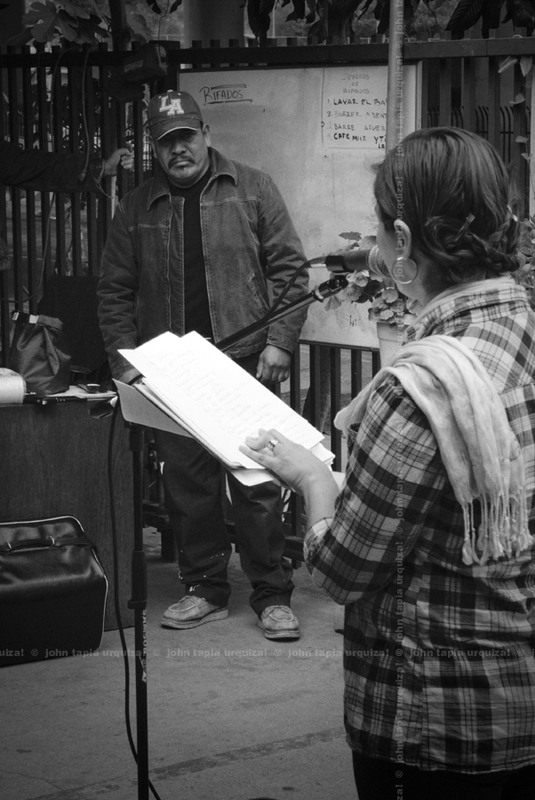 from left to right, day labourer, poet flor de te, the day labourer and poet leonso “el revolucionario” martinez talking with audience member and making final notes on their reading materials at “poesia para la gente”, may 25, 2013, IDEPSCA work center at the home depot, cypress park. poet flor de te reads to herself the poem “¡benditas tus manos mama!” by the day labourer and poet leonso “el revolucionario” martinez at “poesia para la gente”, may 25, 2013, IDEPSCA work center at the home depot, cypress park. 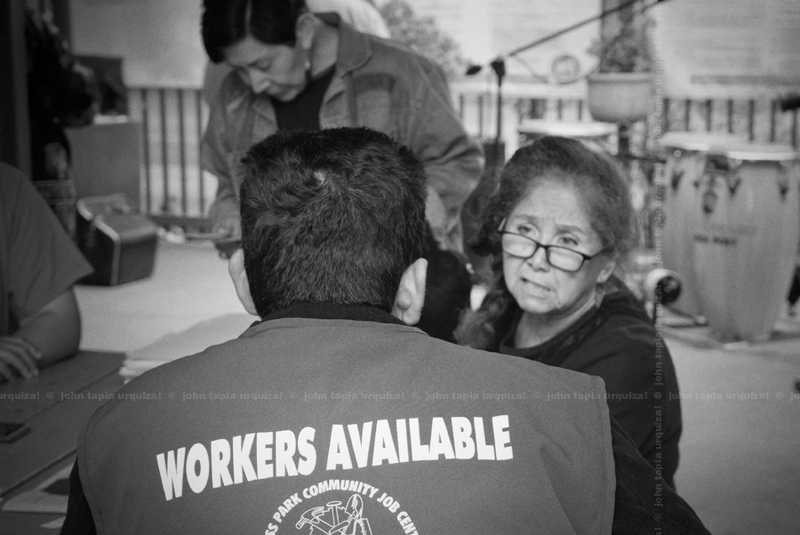 a day labourer not affiliated with the center listens to the reading from the parking lot at “poesia para la gente”, may 25, 2013, IDEPSCA work center at the home depot, cypress park. 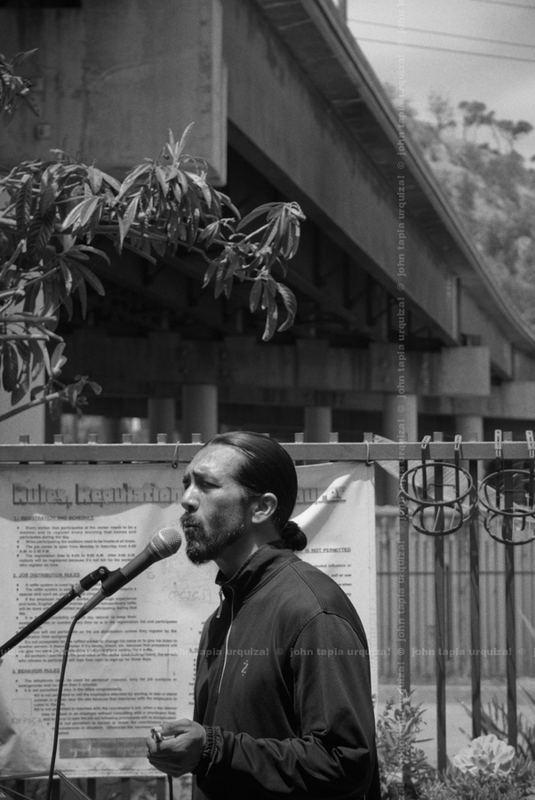 under the shadow of the interstate poet, musician and entertainer raul cardona of teatro arroyo starts the open mic portion with a reading and a manu chau acoustic cover at “poesia para la gente”, may 25, 2013, IDEPSCA work center at the home depot, cypress park.